She is currently the Associate Professor of Viola at the University of Virginia, Principal Violist of the Charlottesville Symphony at the University of Virginia and violist of the Rivanna String Quartet. She has also been on the faculty at James Madison University and Lorain County Community College. She presents masterclasses throughout the south-central region of the country, and serves on faculty at the Tennessee Governor’s School for the Arts each summer. As an orchestral musician, Ms. Balija has performed in such venues as Heinz Hall and Carnegie Hall with the Pittsburgh Symphony. She plays regularly with the Richmond Symphony, Williamsburg Symphony Orchestra, Charlottesville Opera, Victory Hall Opera and the Roanoke Symphony. For twelve years she was also a tenured member of ProMusica Chamber Orchestra of Columbus, helping to promote new music for chamber orchestras through commissions and recordings of new works on the Summit record label. Ms. Balija has performed additional chamber works at Yachats Summer Music Festival (OR), North Carolina Chamber Music Festival and the Staunton Music Festival (VA). 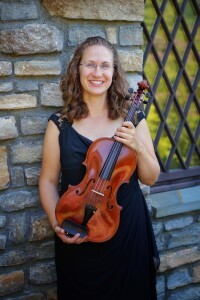 Ms. Balija has performed solo recitals in New Zealand, Oregon, North Carolina, Tennessee, West Virginia and Virginia with programs that focus on the versatility of the viola. A devoted pedagogue, Ayn strives to promote a diverse learning experience. In 2014, she created “Violapalooza”, an annual,all-viola day, featuring viola ensembles, workshops and guest viola artists. Guests have included renowned violists Kim Kashkashian, Roger Tapping, Paul Neubauer and George Taylor. In addition to maintaining a private studio, she teaches in the Charlottesville City and Albemarle County school districts through the Boyd Tinsley Foundation, and coaches and mentors young musicians in the Charlottesville Symphony’s Preludes program. She has been a presenter at the American String Teachers Association and published on the American Viola Society’s Teacher’s Toolbox page. In 2017, she presented a lecture at the 44th International Viola Congress in Wellington, New Zealand. Ayn Balija holds a Bachelor of Music from the Oberlin Conservatory of Music, Masters of Music from The Cleveland Institute of Music and Doctorate of Musical Arts from James Madison University. Her principal mentors have been Peter Slowik, Jeffrey Irvine and Karen Tuttle. When not performing, Ms. Balija enjoys spending time in nature and baking for her orchestra colleagues.